Craps has a certain reputation at the casino for being exclusively for high rollers. Obviously high rollers can play this game if they wish, and some brick and mortar casinos do cater their games for this crowd, but it certainly doesn’t need to be this way if you do not wish. When you are playing online craps, you can always find games with lower limits for you to enjoy, all while taking part in the same action that you have come to expect. Juicy casinos all have excellent craps games, although the software that you will be using may differ slightly from casino to casino. There are a lot of things to consider when you choose which craps game you will spend your time at. Table limits, odds offered, mobile abilities, and software platforms all are big deciding factors in this game. You might also want to look and see if your casino has some of the more exotic craps wagers available since this can provide a lot of extra entertainment, and a big boost to your winnings when your predictions are correct. As you will find with a few other casino games–like blackjack–strategy plays a big part in how well you can perform with this game. 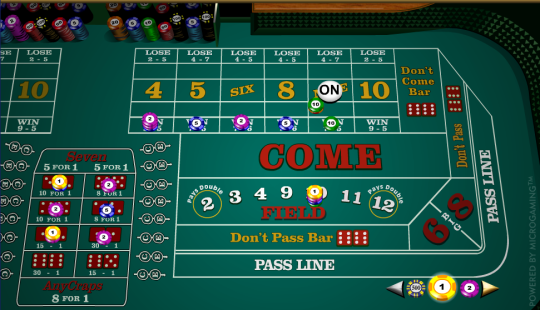 Craps strategy is pretty simple to understand once you start playing, even though the table is set up in a way that might make it seem confusing at first. Basically, to play as close to perfectly as possible, you want to use a combination of pass/come bets, all while maximizing your odds payouts as best as possible. For this reason, finding a casino that allows you to put more money in the free odds bet is going to be very much to your advantage. And don’t forget, one of the biggest advantages of playing craps online is that you can access strategy materials that will help you to make sure that you’re always making the best playing decisions as you go along. Make sure you take advantage of this, because while the game of craps can offer some very good bets, there are also many bad bets designed to trick you into losing your money. Pay attention! Limits are important when choosing a game. If you’re just playing for casual fun, you want something with a minimum bet of around a dollar. You can always bump this up, and you can always place more than one bet as you’re doing well, but craps is a game of swings in cash flow, so starting out small when you’re first learning can be helpful. Some casinos have bigger limits in this game for their high rollers, too, so if you fit into this category, make sure you find a game that will let you bet what you want to bet instead of the more common smaller limits. Mobile online casinos are very popular nowadays, and this means more great games can be accessed from your smartphone or tablet computer. If you want to play craps while you’re on the go, this is definitely worth some looking on your behalf. Many casinos offer craps games with various features for your mobile devices, both on iPhone and Android devices. The best way to get the most out of your craps play is to make sure you are getting all of the bonuses you can. The top casinos all offer welcome bonuses, where your initial deposit is multiplied, but some casinos also offer reload bonuses. These are especially useful if you run out of money in your account, or are unexpectedly low in funds from a previous withdrawal. Bonuses are basically free cash, and if you are playing often, they are well worth your time to scout out. One final thing to consider is how you play. Some casinos have web interfaces where others require you to download a program to play on. Either works, but you may have a personal preference to consider. The same goes with mobile devices. Some require apps to play, while others allow you to play right from your browser. Craps has a long history in the gambling world. In some form or another, the game has been around in the U.S. since the 18th Century when it came to New Orleans, but it originated well before this with the British game called hazard. “Craps” comes from the French word “crapaud” which means toad, a reference to the street craps played where gamblers squatted down while they rolled their dice. Today, when we play online, there’s no need for crouching down in dark uncomfortable alleyways to play this game, although the game will always carry memories of this. Instead, we can play this fun game today right from the comfort of our own homes.